Some people are more meticulous about keeping their iTunes tidy than others. If your iTunes is as messy as a 15-year-old’s bedroom, this fancy plugin might be your saving grace. TuneUp ($30 for unlimited use on one computer, or $20 for an annual subscription) is a plugin that works with your iTunes to clean up track names, find missing album art, and give you additional media based on what’s in your iTunes library. We haven’t forked over the subscription cost yet to test it out, but TuneUp is getting rave reviews. Clean – As the TuneUp slogan says, the plugin fills in missing artist, song, and album data “automagically.” Perfect for those imported mix CDs that you never got the tracklists for, or artist name misspellings. 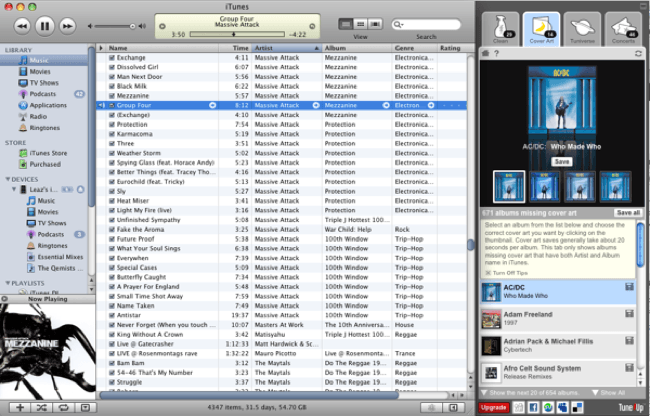 Cover Art – One of the best features about recent versions of iTunes is the visual cover flow of your music library. In this step, TuneUp uses its magic powers to replace those annoying gray music notes with actual album art. Tuniverse – Perhaps the service’s most ingenious feature is its ability to pull up web content directly related to whatever you are playing. This means that when you listen to a track in your iTunes, related content like YouTube videos, Wikipedia artist bios, Google News, and Amazon recommendations will appear in the TuneUp sidebar. You can also share your music selections on the Twitter and Facebook features. Concerts – By taking note of all the artists in your library, TuneUp provides a customized list and/or calendar of upcoming concerts in your city. If you see a show you like, you can purchase tickets directly from the concert link, which also displays the venue and ticket price. According to their website, TuneUp will be able to integrate concerts into your desktop or web-based calendar in the near future. Jump over to TuneUp to see more features, check out their blog, and download.